A blog prepared by Subuddhi Krishna Prabhu. He wants to help devotees that have unbelievable talent by spreading the word. This blog can be used by both who want to use talent and those who are looking for talent. 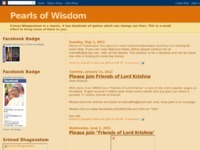 Category Blogs June 7, 2012 by ISKCON Desire Tree.